In My Mailbox is a meme hosted by Kristi at The Story Siren so we can share the books we've received in the past week! I've been seeing Descended by Blood around a lot recently, and am friends with the author on Twitter (she's super sweet), so when I saw that there was a September deal to get the book for $0.99 on the Kindle, I could not pass it up. So excited to see what this book has in store! I am a HUGE fan of the television series, and have been meaning to get to this book for a while. It's just so long, and I've known that once I started reading, it was going to be a long commitment (especially since it's the first in a series). I started reading Game of Thrones on Thursday and am loving it! What amazes me the most is what a good job the television series did sticking with the book. Every scene seems exactly like the author envisioned. Such a fabulous book! I am still waiting to read Game of Thrones - not sure how many books altogether now but it must be a huge page count! A bit daunting. I will get there eventually though. Cool books this week i hope you enjoy them!! Come check out my IMM!! Ooo...I want to read both. i've heard fantastic things about both of your imm books this week, check out mine which includes your book!! Wonderful haul! I hope you enjoy Descended by Blood as much as I did. Angeline Kace is nothing short of AMAZING! Good luck with Games of Thrones. I want to read it but, the page length is so daunting. 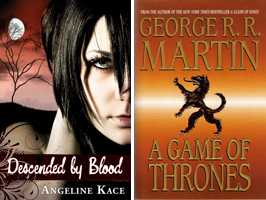 Oh Descended by Blood is on my TBR list as well! Been hearing great reviews on it. As for Game of Thrones, I enjoyed the show, but the book not so much. Hope you have a better experience with it!